The current show at Nielsen Gallery, an institution on Newbury St. for 46 years, is its last. Nina Nielsen and John Baker, co-directors, will be taking a one year sabbatical beginning in July. John will use the time to finish his book on one of the gallery's major artists, Porfirio DiDonna (the gallery manages the DiDonna Estate); while Nina hopes to collaborate with museums, critics and curators on new creative endeavors involving gallery artists. She promises "we will be back!" but in a form yet to be announced. It's a stunning change, and one that impacts the face of Newbury St. Many other galleries (to judge from storefront signs up and down the street) have recently moved, or decamped with new locations yet to be announced. Some spaces have changed hands, and others have closed. Victoria Munroe Gallery, which shared the second floor of the Nielsen space in recent seasons, will be moving further up the block, and is anticipating street-level traffic. I spoke with Nina Nielsen during the opening last Thursday, and she put a positive spin on the changes. The Inventory Show reflects a variety of works from the gallery's long history, and is a way of looking back at decades of exhibitions (the earliest pieces date from the early seventies) that reflects the Nielsen commitment to modernist painting. There are many abstractions, and also some examples of photo-realism that retain a painterly, color-focused approach. "Sold" tags were going up during the opening, and other wall spaces were already empty, as new owners had taken their work home. The goal is to move as many of these pieces as possible, and there are bargains to be had. So the canvases on the wall may well have changed by the time this review is up, and definitely the assortment of works on paper (prints, collages and paintings), which were wildly displayed on the gallery floor during the opening, for anyone to leaf through (and avoid stepping on) will certainly evolve. It's unlikely, however, that the Gallery will deplete its inventory anytime soon. The proceeds will go to the Danforth Museum, and Nielsen was proud that her final show could give something to the community and a respected institution. There were several gems to be seen, united by the consistent gallery taste though of course as diverse as the decades that have passed. Jake Berthot was represented by an unusual pencil drawing, a wooden landscape at night, with light shining through the trees in the distance. 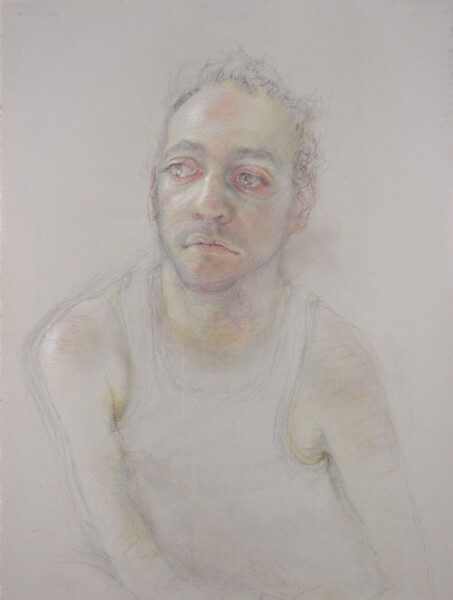 Anne Harris's drawing of "Muscleman Jason" (2004) showed a wide-eyed and sensitive youth with tousled hair, wearing a sleeveless muscle shirt that exposed thin arms. 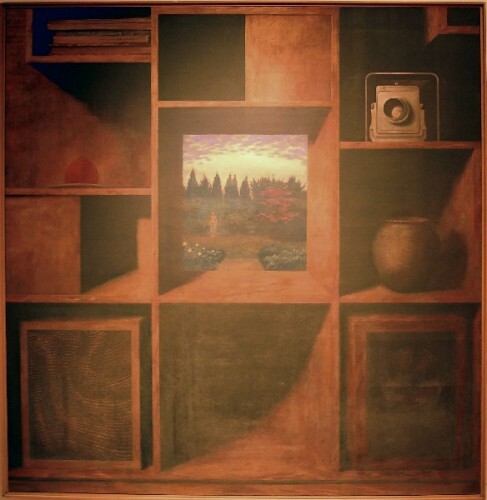 Sungjoon Joh was another of the figurative artists, but "Still Organ" (1995) was an oddly subdued grid of brown shelving holding a few sculptural objects. Nearly monochrome and quietly cubist, the grid gives way in one cubbyhole to a window looking out on a verdant garden. Also dominated by green is "Evocation" by Robert Contois. 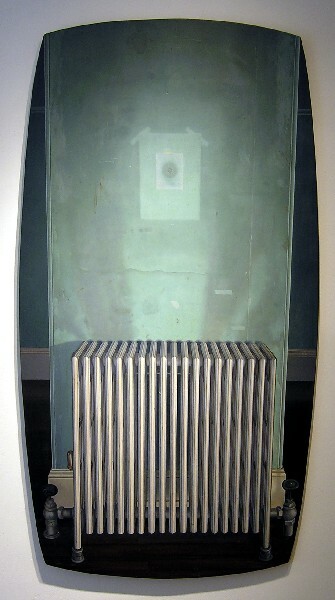 This intense study of the wall behind a radiator shows traces of removed images, shadows of emptiness written into the pockmarked surface of the past. 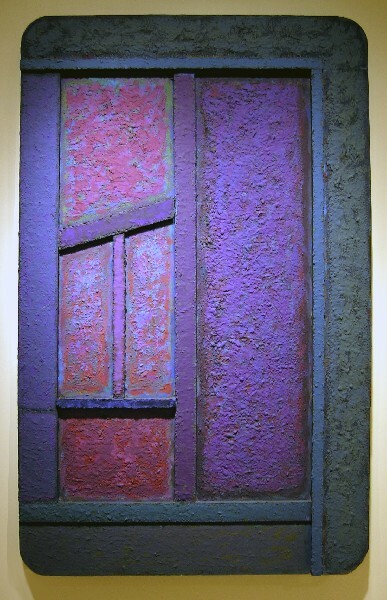 Sam Messer's "Self Portrait" (1984) also records the passage of time, but defiantly. Messer's heavy oils have been scumbled over a mirror, and his painted portrait obscures any the mirror might have caught. In the subject's hand he holds a small skull, contemplating and defying death with angry vigor. 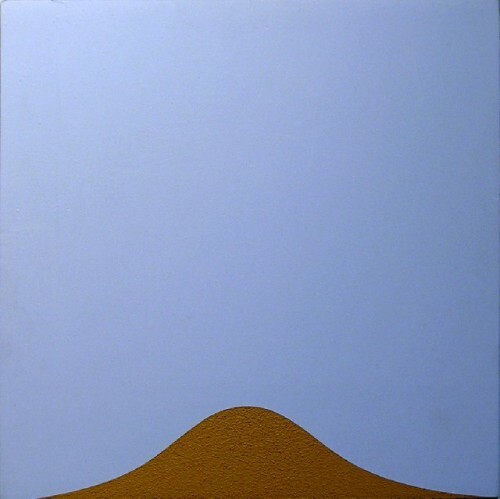 In a humorous vein, Bill Thompson's "Ant Hill" (1992) straddles the line between representation and abstraction. The brown bulge on the bottom, with a sandpaper-y texture, must be the anthill, for above it presses an expanse of sky blue. 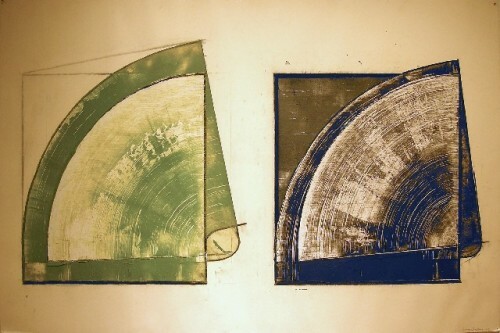 Another small work, by Katherine Porter, revives the Vorticism branch of cubism in "Alpha Centauri," where concentric circles of light seem to be refracted through angular planes and other geometric forms. The edges, however, aren't all that hard, but rather reflect the delicate gestures of small brushes loaded with oil paint. The surface is fractured into a rainbow of carefully considered colors. Porter evinces the hand-made, expressive and gestural love of paint that Nielsen Gallery has always championed.